Female workers in a garment factory in Bangladesh. Much has been said about the importance of economies “moving up the value chain,” which essentially means that by learning increasingly more sophisticated aspects of the production process, a country can eventually learn how to do the full process itself, and depend less on importing intermediate goods. If it gets really good at the process, it may eventually become an exporter of a more sophisticated component. Creating strong links across the value chain is the key to specialization, and the process of firms networking with suppliers and users in related sectors is a manifestation of the ‘learning by doing’ component to increase productivity. A recent ADB study on Bangladesh suggests that some of the success of the ready-made garment (RMG) sector over the past 25 years is unlikely to provide the same type of benefits to the economy going forward, because the conditions that led to its success are changing. Policy-makers should remove the anti-export bias for non-RMG exports, thus levelling the playing field, and creating the conditions for other potentially high-performing activities to flourish. Why is this relevant for Bangladesh’s garment sector? Ideally, successful structural transformation should consist of two types of processes at this juncture: (i) diversify away from garments into other manufactures by producing goods that entail increasingly more complex manufacturing processes compared to garments, but are still similar enough that it is easy for workers and managers to figure it out (arrow ‘A’ in the Figure); or (ii) link to the fashion industry global production chain and provide increasingly more complex and valuable parts of garments (through reverse engineering of weaving machines, for example, or through increasing involvement in the design process of the garment [‘B’ in the Figure]). 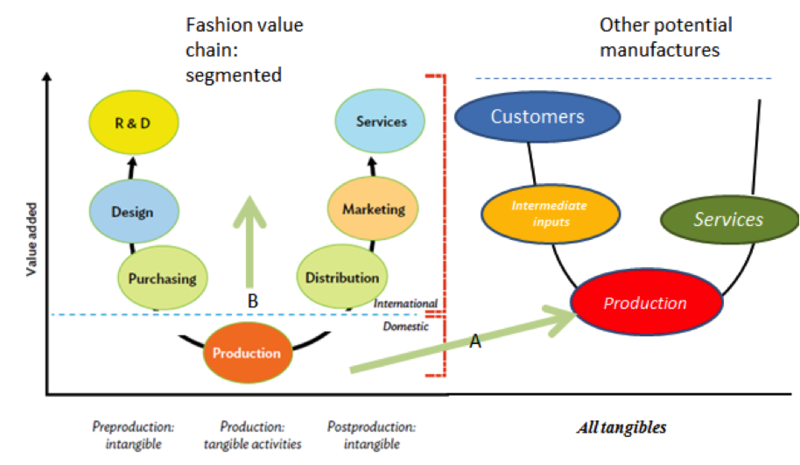 The study shows that if the country chose avenue ‘B’, that is, by moving up the fashion industry value chain, increasing overall productivity will be very difficult because of the segmented nature of the value chain. It is thus much easier for Bangladesh to make a product similar to garments, such as footwear or small appliances, than to begin to appropriate and understand the various aspects of designing and retailing clothes. First, the value buyers attribute to clothes—reflected in the price they are actually willing to pay—is a process created in a place geographically and information-wise very far, at the retail end, where fashion fads and volatile markets operate in a complicated way. Second is the broken link of accountability once the garment is shipped abroad. The sector’s production process is completely decoupled informally from the fast-fashion production process. This segmentation also exacerbates the dissociation between the unit cost of production in Bangladesh and its retail price: factories sometimes send the clothes with the price tag—even the sales price—so they are floor-ready. It is possible to send one box to New York with shirts price-tagged at $50 each, and the identical box to rural New Jersey with shirt price-tagged at $5 each. The price is completely independent of the actual cost. As long as the big buyers maintain price-setting power, garment makers have no incentive to upgrade facilities or enhance workers’ skills because race-to-the-bottom, cost-cutting measures will always take precedence to guarantee a firm’s survival. Moreover, because of the focus on meeting orders on time, firms have little leeway to become more proactive at anticipating buyers’ needs. Ironically, being at the bottom of the value chain is also related to the fact that garment factories are predominantly locally-owned. Even in Cambodia, another large exporter of basic garments, factory owners are mostly foreign investors seeking cheap labor, so by definition those factories are linked to the global value chains. In the case of Bangladesh, though, factory owners are mostly nationals and economically powerful business persons who have found ways to get around the institutional loopholes and inadequate infrastructure—a feat difficult for foreign investors to master—but ultimately their orders are based only on delivering the specified good on time and at the lowest possible price, beholden to the specifications of clients. There are also limits on the input side. The vast majority of machinery and the raw materials are imported, and it’s hard to find sufficiently skilled domestic workers to operate sophisticated machinery, let alone maintain it. Workers also find it very difficult to move up the value chain as well, as discussed in a related study. First, their level of education is low, the quality of basic education is questionable, and still about 60% of the population as of 2013 was functionally literate. The mechanical nature of the work and the large volumes handled means that there is very little time for a typical garment worker to ‘look up and think’ and consider new ways of doing things. Many of them, young females, feel lucky to have a job to support their families, and prefer to just follow orders rather than contemplate innovative ways to improve the production process. If the level of general education were higher, or having initiative were more encouraged by managers, some motivated workers could be promoted to floor managers, or to a more skilled job such as cutting and measuring. Even so, some may lack the skills to move into more complicated tasks. Since middle-management skills are scarce, factory owners import middle managers from neighboring India or Sri Lanka at substantial cost, instead of training their own. The remarkable success of RMG is a testament to the real comparative advantage of Bangladesh: the ability to move on and deliver despite enormous challenges. ADB analysis shows that there is lots of potential in activities such as light engineering, back-office software development, and repair of machinery and equipment. All of these activities create strong forward and backward linkages with other sectors, which essentially is the genesis of the formation of new value chains. Productive activities can start small and then turn “global”. With a young and growing middle class, the domestic consumer market can be a testing ground for many new activities that can take advantage of those capabilities. Stay tuned for part II: what is happening at the retail end?